A Lalanne “Moment” at Christie’s: Touring the 20th Century Decorative Arts & Design Sale with Specialist Jeni Sandberg. It is that time of year again when the gavel hits the podium and the word “sold” rings through the hall. The late spring-early summer auction season is always closely watched by specialists because this is when the most prestigious items hit the auction block. However, with the weak economic climate this has also become a very nerve-racking time for auction house specialists, dealers and consignors. One thing that has become apparent to anyone following the auctions is that the catalogues have gotten slimmer. It had become customary to use the catalogues as doorstoppers but the last Christie’s Important 20th Century Decorative Arts & Design Sale catalogue only featured 105 lots. This is actually a good thing because one hopes that a smaller selection implies a well curated sale. And Christie’s did have some interesting things. Anyone walking by the Rockefeller Center headquarters of the auction house would have noticed the giant copper and stainless-steel topiary dinosaur, known as the Dimétrodon II (Lot 92) from 1989, by the French designer Francois-Xavier Lalanne (1927-2008) based on a similar model designed in 1989, displayed outside the revolving doors. The estimate of $80,000-$120,000 is justified by what Jeni Sandberg, a Specialist in the department, says is a “moment.” According to the catalogue, Francois-Xavier and his partner and wife, Claude (born in 1925) began to design topiaries in 1979 and in 1989 won a commission to create public fountains for Santa Monica, CA which were displayed on the Third Street Promenade. 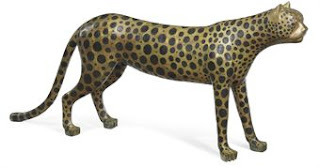 Additionally, the sale featured several other Lalanne pieces such as Tortue Topiaire III, a copper turtle topiary from circa 1988 (Lot 91, estimated at $20,000-$30,000) and Guépard, Tête de Côté’, a patinated bronze cheetah from1995 (Lot 90, estimated at $80,000-$120,000). While the Lalanne’s are often refereed to as a team, they did not work together although they did share a similar aesthetic. Francois-Xavier, who died in December, created life-size sculptures of animals, in copper or bronze, which could also be used as furniture. A favorite of mine is a bronze rhinoceros desk that I saw at the Paul Kasmin Gallery once. Claude’s work is more organic. For example, the Christie’s May Arts Décoratifs du XXème Siècle et Design auction in Paris featured a pair of gilt bronze gates which resembled tree branches (Lot 60). I wondered out loud if this “moment” has anything to with the fact that works by the Lalanne’s were featured in the very successful and highly publicized Yves Saint Laurent sale, also held at Christie’s Paris in conjunction with Pierre Bergé & Associés, which took place in February of this year? For example, François-Xavier Lalanne’s YSL bar (1965) sold for €2.7 million with an estimated of €200,000 – €300,000. That sale created such a buzz that anything featured in it, regardless of how great the design, brought in record prices. The sale of 733 lots totaled $484 million dollars in three-days. Although Lalanne’s work may be having a “moment”, the Dimétrodon II failed to sell. 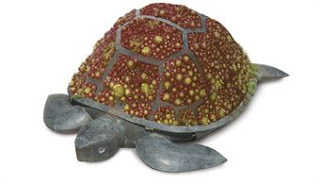 However, the smaller pieces did: the Tortue Topiaire III brought in $52,500 and the Guépard $74,750, just slightly below its low estimate. It is interesting to see how long this “moment” will last. Or perhaps it is already over as the market is quite fickle these days. Images from top to bottom: FRANCOIS-XAVIER LALANNE (1927-2008) ‘Tortue Topiaire III’ A Copper Turtle Topiary, circa 1988 (lot 91) and FRANCOIS-XAVIER LALANNE (1927-2008) ‘Guépard, Tête de Côté’ A Patinated Bronze Cheetah, 1995 (Lot 90). Images from Christie’s Important 20th century Decorative Art & Design 2 June 2009 sale at New York, Rockefeller Plaza.